On April 20th, 2011 the nation lost a great photographer, photojournalist and friend. Christ Hondros graduated from North Carolina State University with a degree in English and after finishing a masters moved to New York to pursue international reporting. Hondros has covered most of the world’s major conflicts since the 1990s, and appeared on covers of magazines and most major newspapers. He has covered conflicts in Angola, Lebanon, Afghanistan, Iraq, Liberia, to name a few. His work has appeared in the New York Times, Washington Post, Newsweek and the Economist. 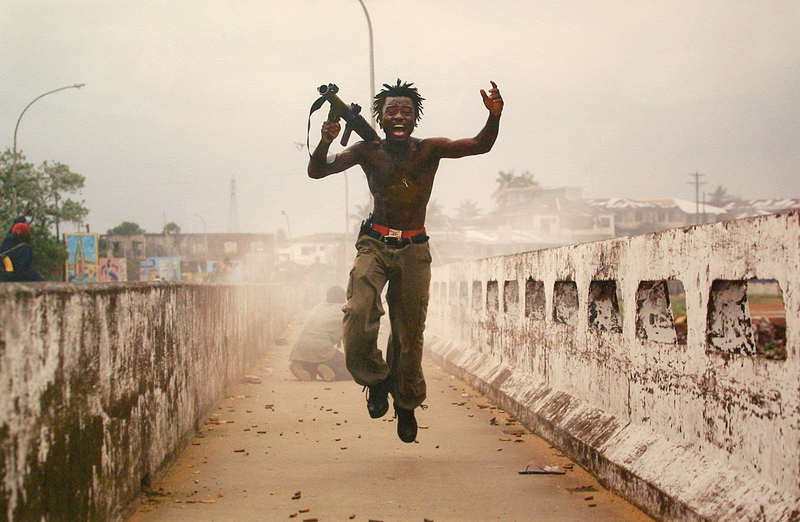 In addition to winning lots of awards, Hondros was nominated for a Pulitzer Prize with the photo seen below of a Liberian loyalist commander exulting after firing a rocket at rebel troops in Libera in 2003. In August of 2005 Hondros did a special exhibit for the Gregg, entitled, “War in Shadows and Light” featuring images from conflicts in the middle east and Africa. The museum chose to feature his work because, as Director Charlotte Brown said, “his work is so strong; it has a powerful immediacy that transcends the subjects and a promise that is profoundly exciting and deserving of attention.” Some of the images from this exhibit can be seen here or on the homepage. N.C. State’s Technician’s story on the loss on Hondros. N.C. State Student Media’s coverage of Hondros’ visit to campus. The Independent Weekly’s longer tribute to Hondros and fellow photographer Hetherington. An inspiring look at Hondros’ connection with the man in the above photograph. A link to his photoblog with the New York Times. A touching piece by the Boston Globe. Various local counts of his death. If you, or someone you know, would like to make a donation to N.C. State in Chris’ memory, we are working with University officials and the family to set up an endowment in his name. We can begin collecting donations now that will go into a holding account. After we raise $25,000, we can create scholarships or other opportunities in Chris’ name, depending on the wishes of the family. In the unlikely event that we do not raise $25,000, we can still use the money for programmatic needs such as a speaker series like the University Scholars series that has that brought Chris to campus twice in the last two years. Such donations are fully tax-deductible. Enclose a note stating that the money is being donated in memory of Chris Hondros.